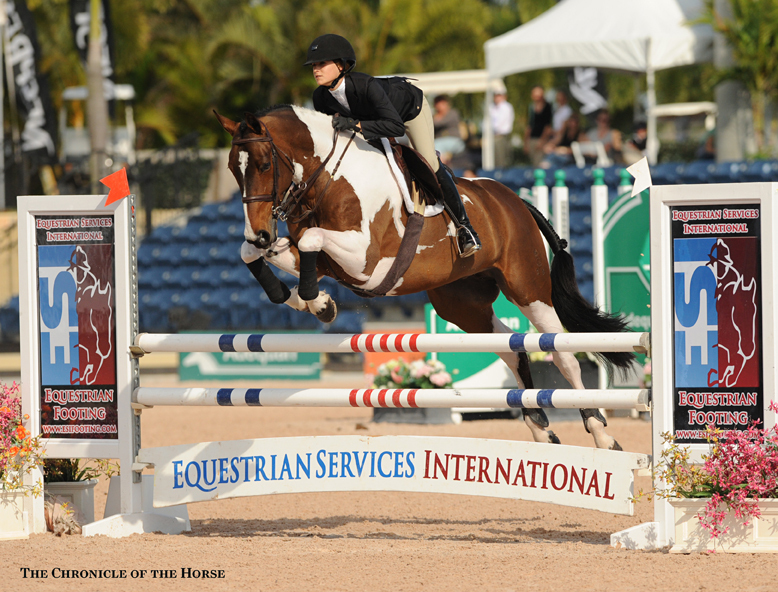 What do you get when you take the best 29 riders at the FTI Winter Equestrian Festival, whisk away their trainers, and make them prepare for and ride over a championship course on their own? Plenty of top rounds, and astronomical scores to boot. 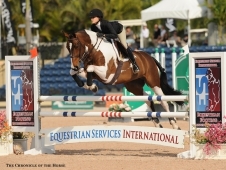 Winner Lillie Keenan earned a raw score of 96 in the George Morris Excellence In Equitation Championship, as did third-placed Gabrielle Bausano. 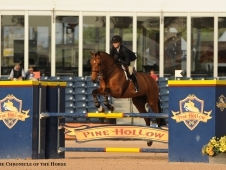 Michael Hughes (second) and Megan MacPherson (fourth) both earned marks of 94. That’s no mistake. 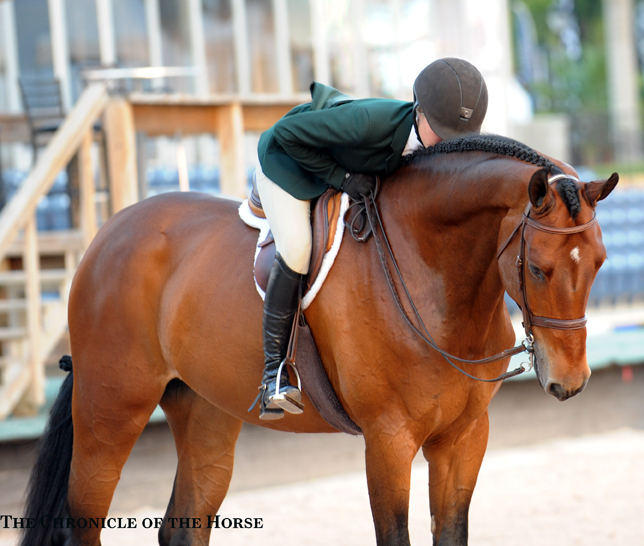 Riders qualified for tonight’s class by winning qualifiers for major equitation classes during circuit. 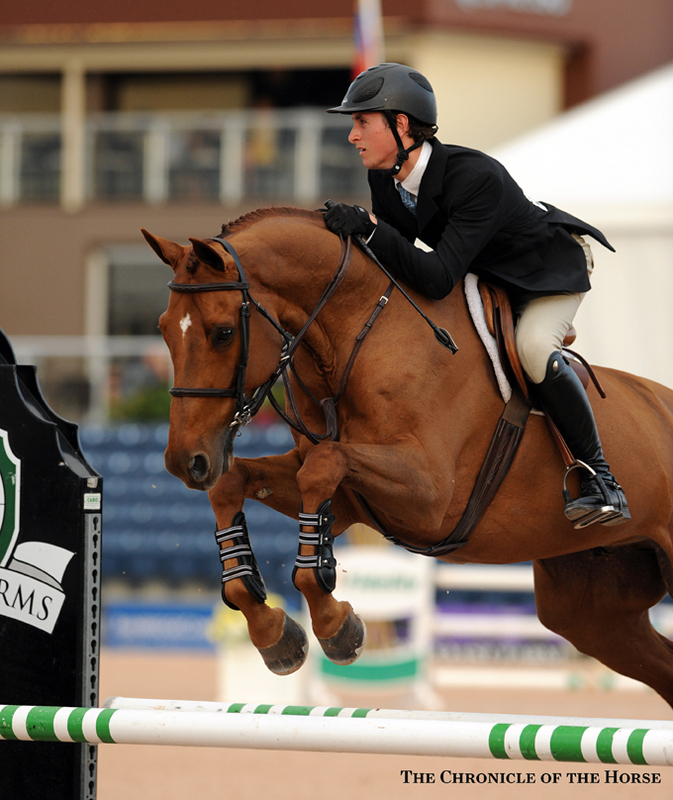 It’s so important for many riders and trainers that a few, like Hughes and Ashton Alexander, came down after HITS Ocala (Fla.) wrapped up to compete. There were plenty of nervous riders (and last minute boot polishing) as competitors piled into a designated box to await a riders’ meeting. 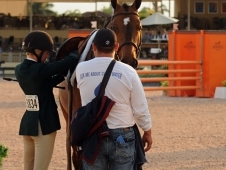 Officials at WEF aren’t kidding about this class’s “no communicating with trainers” rule. 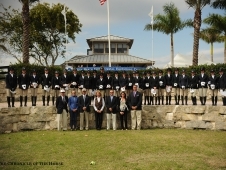 Stewards collected cell phones, no one was allowed on the field except the riders during the coursewalk and staff eyeballed the warm up and in-gate area to make sure there was no one wandering over to pass along any advice. 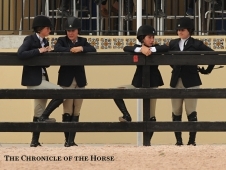 Each rider brought a groom to set jumps and polish hooves, while trainers, parents and barnmates whooped from the VIP lounge or adjacent boxes. 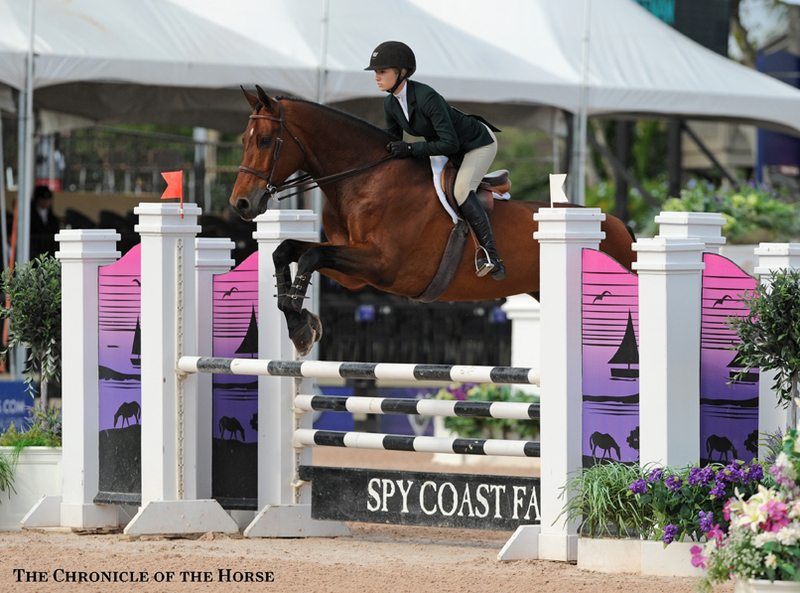 Fresh out of the junior ranks herself, Reed Kessler served as the warm-up judge, assigning a mark between 0 and 6 for each round based on each rider’s preparation. 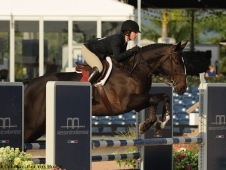 Things got off to a bit of a rocky start when McKayla Langmeier and Skyfall, first in the ring,l had a miscommunication at fence 2, sending her into the dirt. 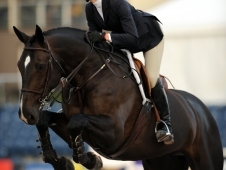 (Langmeier was on her feet quickly, and led Skyfall out of the ring.) United decided he wouldn’t have anything to do with a fence set near the open water despite Haley Banas’ best efforts to finesse him through the trouble, they headed back to the barn early as well. 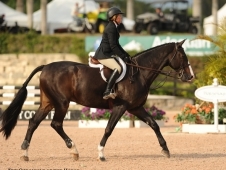 Allison Toffolon, who finished second earlier this circuit behind barnmate Keenan in the Sam Edelman Equitation Championship, dropped out of the race when Class Action stopped coming out of an in-and-out. 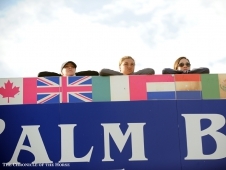 The top 12 riders returned for Round 2, and a test was incorporated into the course. 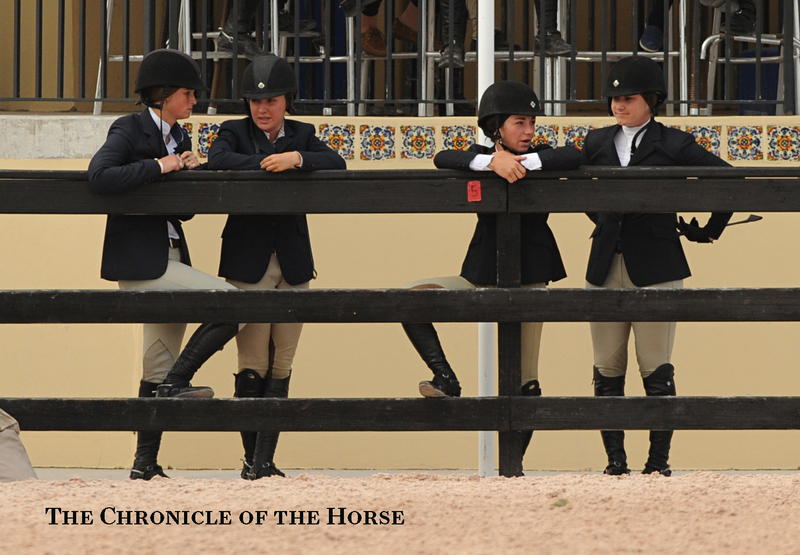 After fence 3, an oxer, riders had to return to walk and show a simple change of lead, then jump fence 4 from counter-canter. 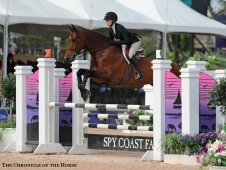 Riders had to canter fence 6 and trot out of the line, then demonstrate a flying change between fence 7 (which headed toward a turn) and fence 8, coming out of the turn. This round separated the top contenders from those not having their best day. 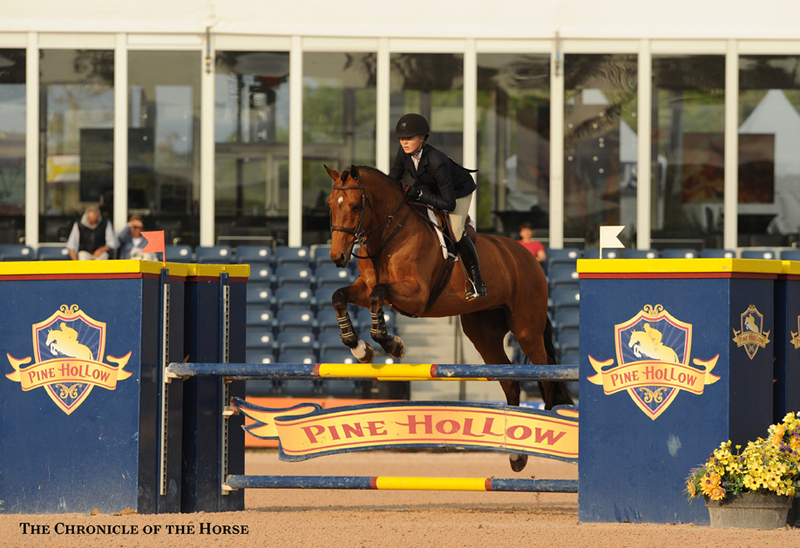 Second-ranked Tori Colvin (who won here last year) fell to eighth when VIP Z pulled a rail at the first fence. 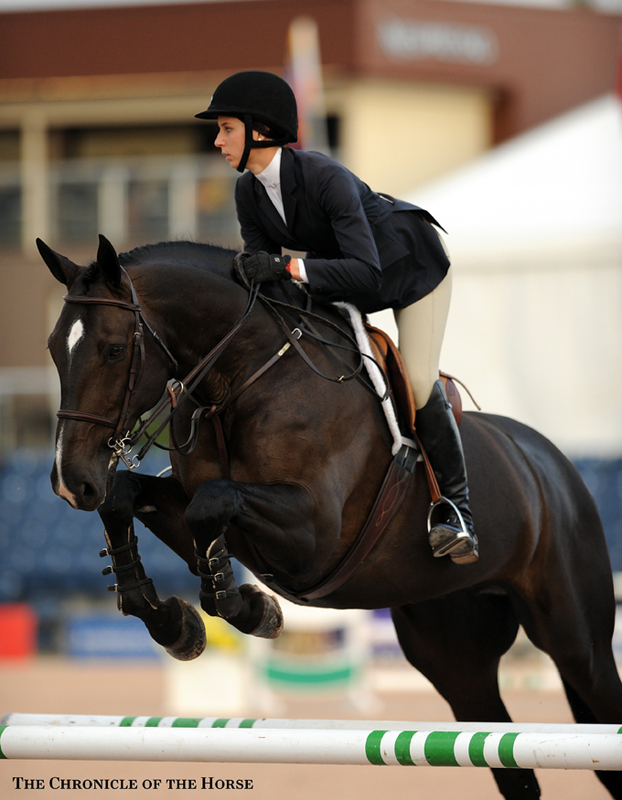 And Charlotte Jacobs and Spencer Smith both had lead trouble that knocked them out of the running for a top spot. 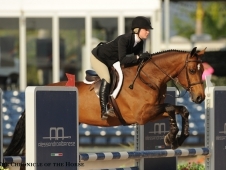 MacPherson, who like Bausano is also trained by Stacia Madden and the Beacon Hill team, held onto her top spot with a great second round. 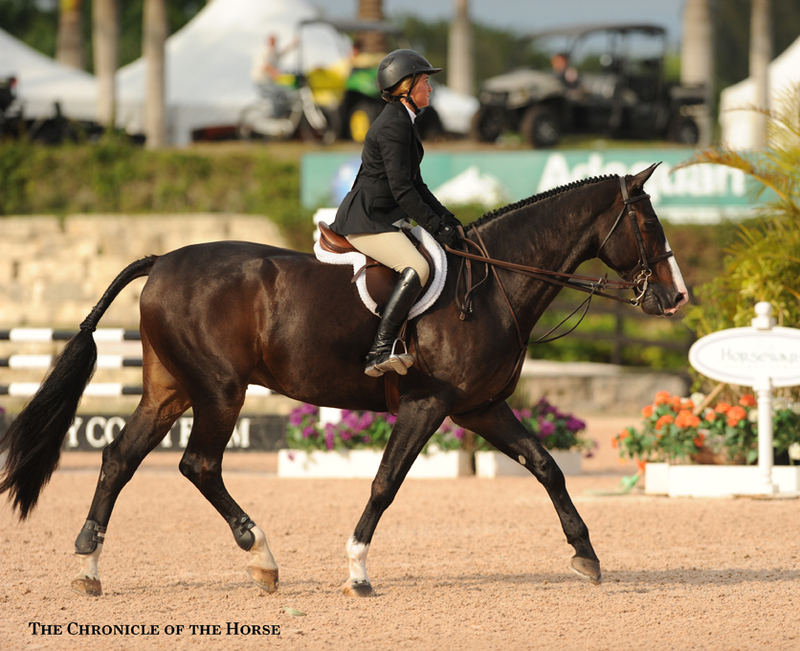 When it came time for the test, the top four horses led their mounts into the ring to trade and repeat Round 2. 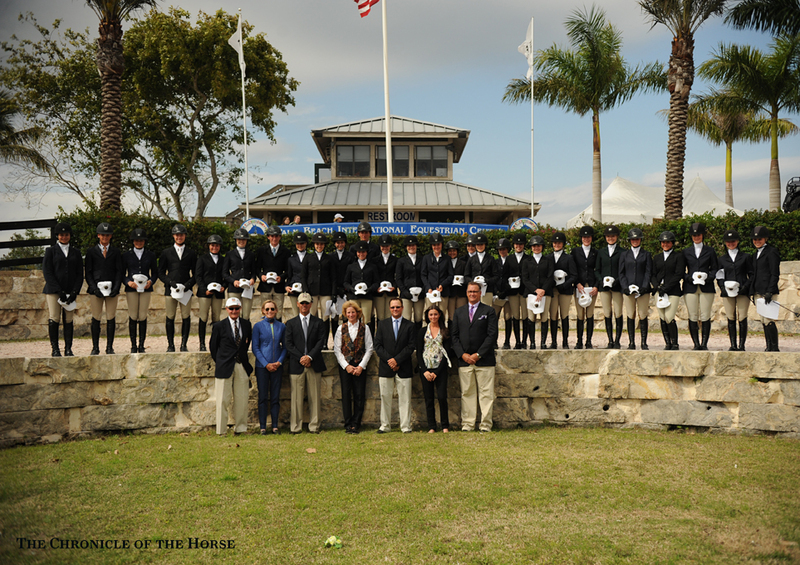 Keenan and MacPherson swapped, as did Hughes and Bausano. 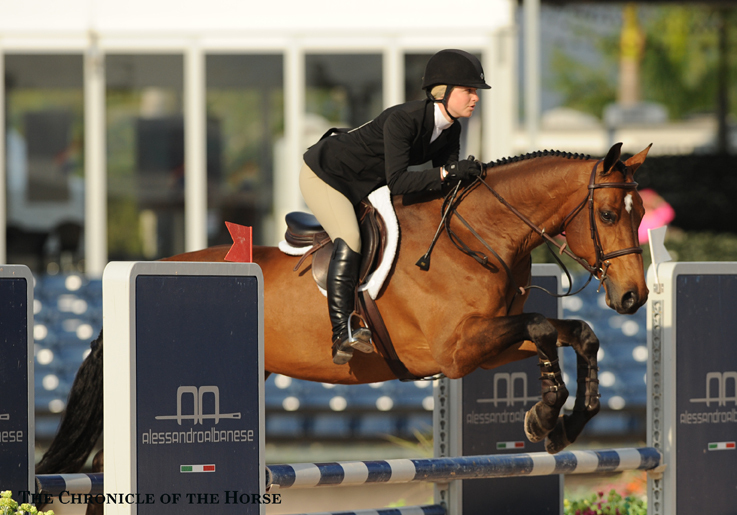 Hughes, who’s trained by Missy Clark and Northrun, went first and laid down a flawless round on Bausano’s mount, San Remo VDL. 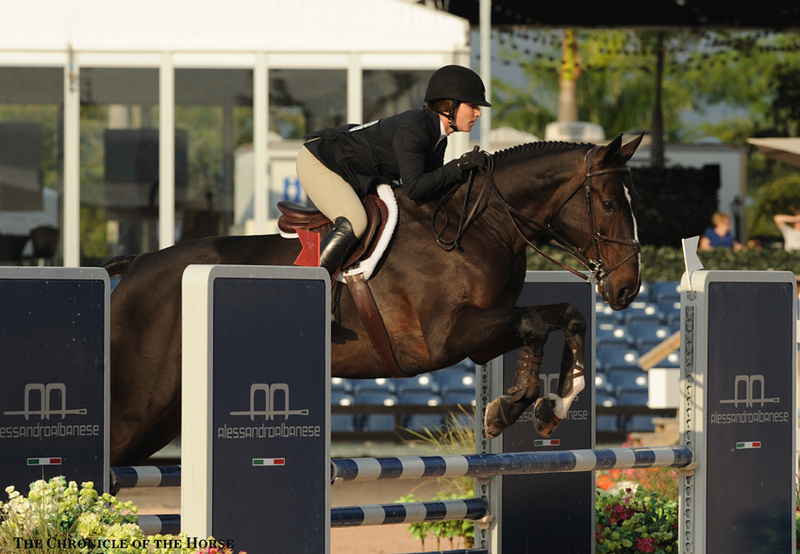 Bausano didn’t have the round she was looking for on Hughes’ Zagreb, losing her lead at the counter-canter. 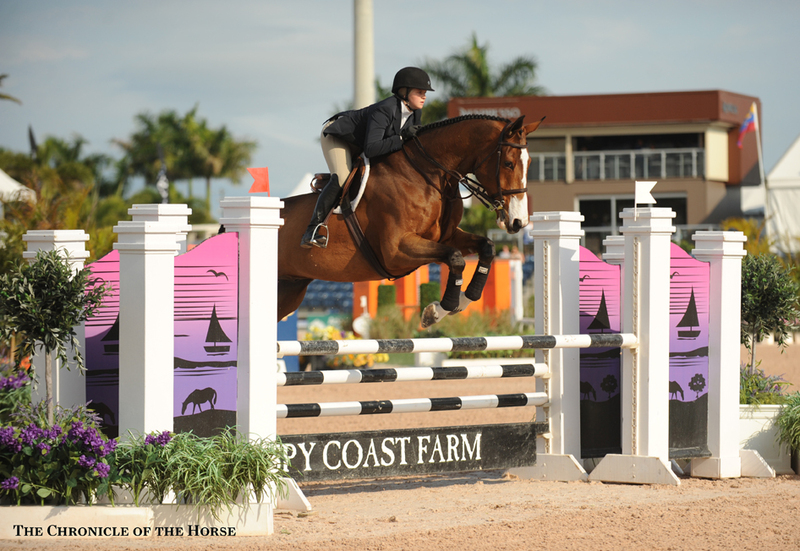 Keenan repeated her flawless round on MacPherson’s Great Expectations. 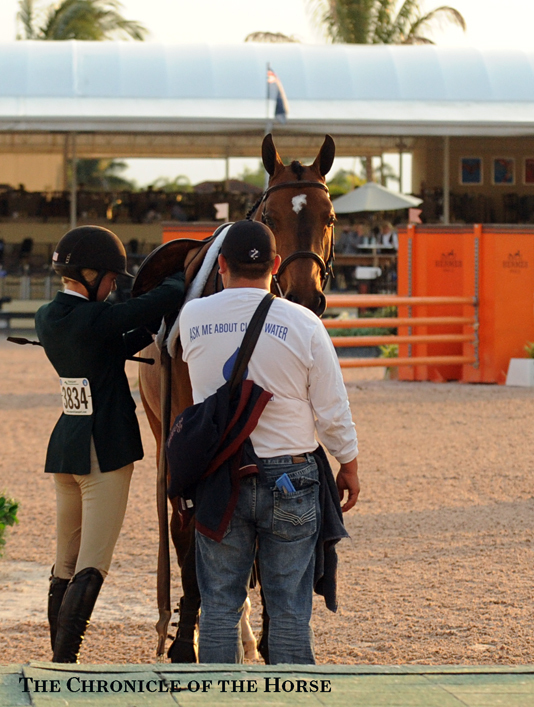 Last to go, MacPherson came to grief at fence 3 where she pulled a rail. 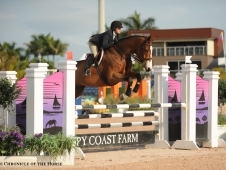 MacPherson described her mount as “petite and very wiggly,” and swapped onto Keenan’s towering, giant-strided ex-jumper. 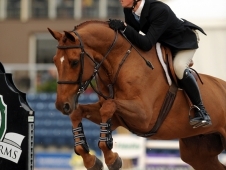 That horse, Clearway (Cheenook—Lacrima), was Keenan’s partner for runner-up slots at both last year’s Pessoa/USEF Medal Finals (Pa.) —where he won best equitation horse—and ASPCA Maclay Finals (Ky.). Regardless, he’s short on experience, having just been imported just about a year ago.